In this post, we describe an implementation of the N Queens Problem, which is a puzzle related to optimization, combinatorics, and recursive backtracking. The puzzle asks: how many configurations are there for placing 8 queens on a chessboard such that no queen can attack any othr queen? This problem was implemented in Perl and in Java, the solution results were timed, and the codes were profiled. While Perl is an interpreted language, and is therefore fully expeted to be much slower than Java (which indeed it is), it is still useful to compare the performance between these two codes to gain an appreciation for the advantages and disadvantages to both approaches. Recently I read an (11 year old) article by Steve Yegge entitled "Execution in the Kingdom of Nouns." In it, Steve describes the way that in Java, "Classes are really the only modeling tool Java provides you. So whenever a new idea occurs to you, you have to sculpt it or wrap it or smash at it until it becomes a thing, even if it began life as an action, a process, or any other non-'thing' concept." The article inspired me to try on this verb-oriented mode of thinking in a more... active way. Prior experiences with OCaml were confusing, and Haskell continues to evade me, so it was easier to dust off old Perl skills than learn enough Haskell or Ocaml to solve N queens problem. Perl was the next-closest verb-oriented "scripting" language. I was also familiar with the N queens problem, since I'm a programming instructor (I'll let you guess which language), and it seemed like a nice problem for both noun-based and verb-based approaches. But it also meant I had to learn enough Perl to solve the N queens problem. ...or, use the Perl solution to the N queens problem from Rosetta Code. So here's the plan: study a verb-oriented implementation of this canonical, deceptively subtle programming problem in Perl; translate it into a verb-oriented Java program; and run the two head-to-head, using a profiler to understand the results. The N queens problem predates computers - it's a chess puzzle that asks: how many ways can you place 8 queens on a chessboard such that no queen can attack any other queen? That's bigger than the net worth of most U.S. Presidents! If we implemented a dumb brute-force solution that tested each of these configurations, we'd be waiting until the heat death of the universe. This still-large number of possibilities can be further reduced by using the same procedure, but checking for invalid rows based on the diagonal squares that each already-placed queen attacks. This covers each precondition for a solved board, and allows the base case of the recursive backtracking method to be as simple as, "If you've reached this point, you have a valid solution. Add it to the solutions bucket." Now, let's get to the solution algorithm. As a recap, we dusted off our Perl skills to utilize an N queens solution in Perl from Rosetta Code. Both codes use integer arrays to keep track of where queens are placed. Solutions are stringified version of these arrays, consisting of 8 digits. After looking at the Rosetta Code solution for a (long) while and marking it up with comments to understand what it was doing, I decided it was precisely the kind of verb-oriented solution I wanted to test out to compare Perl and Java. It uses no objects, but instead relies on fast built-in data structures (arrays), for loop expansion (only for my $i (1 .. $N), no for($i=1; $i<=$N; $i++)), and basic integer math. The cost of solving the problem comes down to basic indexing and array access. This is the kind of solution I imagine a human calculator like Alan Turing or John Von Neuman looking at, nodding, and saying, "Makes sense! (And by the way the answer is 92.)" # so we need a base case and a recursive case. # so we found a solution. # which are the row numbers of prior queens. # instances of this recursive function. # so that we can cut down on the search space. # don't bother exploring it. Starting with the Rosetta Code solution in Perl, I translated the algorithm into Java, sticking as closely as possible to the Way of the Verb. I replicated the solution in Java with a minimal amount of object-oriented-ness. A Board class simply wraps the same set of arrays and array manipulations that the Perl solution implements directly. These constitute the lookahead check for safe places to put the queen. The Java solution implements a static class containing a Linked List to store solutions. This is the only use of non-array objects and has a trivial impact on the solution walltime. Initially I was using the Unix time utility to time these two, and it seemed to be close for smaller problem sizes (N=9 or smaller) - Perl would start up and run faster than Java, measured end-to-end. But when you time the program by using timers built into the language, it removes some of the overhead from the timing comparisons, and Java becomes the clear winner. We can dig deeper and understand this comparison better by using some profiling tools. I profiled Perl with Devel::NYTProf , an excellent Perl module available here on Cpanm. More details about the profiling tools I used for Perl are on the charlesreid1 wiki at Perl/Profiling. This puts the CSV file in a folder called nytprof/. The CSV output of the NYTProf module gives a breakdown of the amount of time spent in each method call, how many times it was called, and how much time per call was spent. From this we can see the busiest lines are the lines accessing the arrays, and looping over the rows. 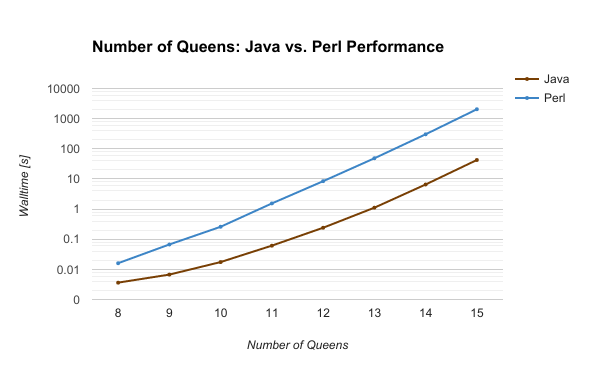 This is confirmation that this algorithm is testing the performance of the arrays, and confirms the N queens problem is profiling Perl's core performance with its built-in data structures. The profiling results of the 11 queens problem are shown below. The second column gives the number of times this line is executed - 164,246. This is actually the number of solutions that are tried, excluding the deepest depth of the tree (the base recursive case). The Java profiler will show us that Java explores the exact same number of solutions, which is confirmation that these tests are comparing the two languages on equal footing. I profiled Java with two tools, the Java Interactive Profiler (JIP) and the HPROF tool that Oracle provides with Java. This results in a profile.txt file with detailed profiling information (an example is shown below). The profiling results from JIP for the 11 queens problem are shown below. From this output we can see that the method getDiagAttacked, which is called each time we check a solution in the recursive case, is called 164,246 times - exactly the same number of solutions that the Perl profiler showed. One of the downsides of the JIP profiler is that it only gives high-level profiling information about methods and classes - it stops there. Fortunately, however, the HPROF tool picks up where JIP leaves off. The HPROF tool makes the program much slower but yields a huge amount of information. In addition to an enormous heap dump of all objects appearing on Java's heap at any point, it also shows where the time was spent in the low-level methods. HPROF tells us that over 86% of the time spent on this program was spent accessing integer arrays. Again, confirmation that we are getting a fair measurement of Java's performance with a core data type, the integer array. Using the results of the profilers from each N queens problem, N = 8 .. 15, I extracted the total number of solutions tried, and confirmed that these numbers were the same between Java and Perl for each of the problem sizes. 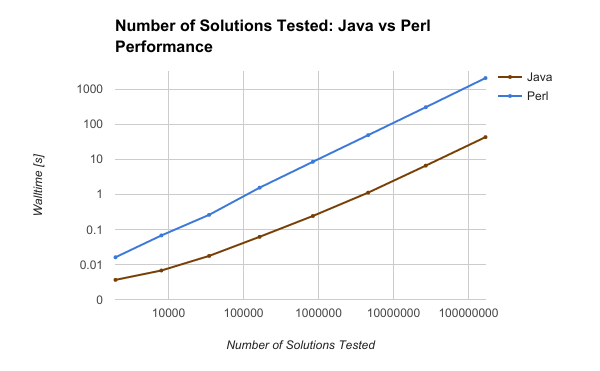 When the wall time for Java and Perl are plotted against the number of solutions tested, an interesting trend emerges: the two scale the same way, with a fixed vertical offset. While this is proving what we already knew, that a compiled language beats a scripted language every time, it also provides proof Perl can scale as well as Java - it just takes significantly more overhead and time per statement. Compiled languages are turned into bytecode and pre-optimized for the processor. Perl is a scripted and interpreted language, like Python, evaluated piece by piece. So, we didn't learn anything surprising. But we did find an interesting result - Perl can scale as well as Java in its implementation of the N queens recursive backtracking algorithm.